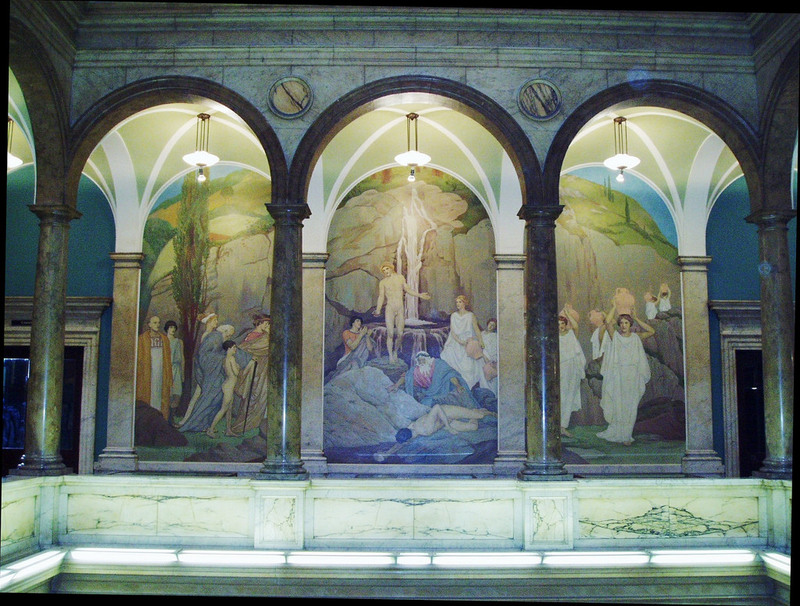 "The Fountain of Knowledge was selected by Mr. Gammell as an appropriate motif for a mural decoration in a public library. The Fountain which appears in the center panel is guarded by Apollo. In the right panel the Nine Muses are seen carrying the waters of the Fountain of Knowledge to the world. In the left, a group of sages, one of them blind and led by a boy, are arriving to refresh themselves. 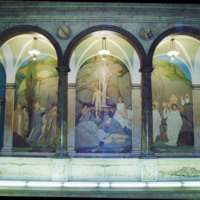 Mr. Gammell's murals in the hemicycle of the Toledo Museum of Art and private residences in Boston, Providence and Washington have been highly praised. He was a pupil of William Paxton before he began independent work as a painter of murals and portraits"
Richard C. Jenkinson Collection (Newark Public Library). Mural paintings by Ives Gammell. Newark, N.J.: Newark Public Library, 1929.